The Blood Bowl 2 beta is now underway, meaning that if you've preordered the game, you might already be playing it. And if not, you can still enjoy this new gameplay trailer that introduces the Bretonnians, who are highly-skilled, very expensive, and strong, but still a bit fragile compared to some of the other players they'll face. Blood Bowl 2 is essentially an ultra-ultra-violent version of American football, set in the Warhammer Fantasy universe. As you might imagine, injuries (and fatalities) run at an alarming rate, but in spite of its vicious nature, teams from the beefier side of the Warhammer rulebooks don't necessarily dominate: Gut-stomping is good, but as the new trailer makes clear, magic goes a long way toward balancing the scales. 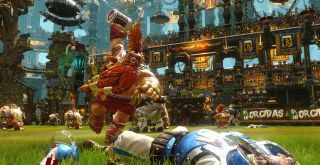 Blood Bowl 2 comes out on September 22, which is less than two weeks away, but you can get into the beta right now if you're willing to pre-purchase on Steam. The beta includes four playable races—Humans, Orcs, Dwarves, and Skaven—plus "friendly" matches against local, online, or AI opponents, multiplayer leagues, team and league management and creation functionality, and the "Cabal TV" replay mode. Those who pre-purchase will also be given their choice of a bonus playable race, either the Lizardmen or the Wood Elves.